18-story Regions Plaza and is actively seeking office tenants, putting the final nail in the coffin for a Birmingham developer’s three-year plan to turn the property into a $61 million luxury hotel. Efforts to reach the broker listed on the sales flier were unsuccessful Tuesday. The office tower at 417 20th St. North will get new life after being vacant for three years when Regions Financial Corp. moved the last of its employees to the larger Regions Center at the opposite corner of Fifth Avenue North and 20th Street following its merger with AmSouth. West Second Street specializes in leasing and developing space to federal offices through the U.S. General Services Administration. However, the sales flier declares all of the 218,000-square-foot building is available for lease. The firm’s purchase of the Regions Plaza ends all hope of Harbert Realty Services’ grand plans to transform the office tower into a Marriott Renaissance Hotel. The real estate company tried to put together financing that would have created a 261-room, four-diamond hotel with a 2,100-square-foot Marriott Club Lounge on the top floor, a Starbucks coffee shop in the lobby and a grand ballroom on the second floor. Efforts to reach an official with Harbert Realty were unsuccessful Tuesday. Regions worked with Harbert but eventually decided to market the building for sale while the company continued to try to make the hotel deal happen. Regions hired the Atlanta office of CB Richard Ellis a year ago to market the building for sale with an asking price of $7 million. Regions would not disclose the actual sales price Tuesday. Birmingham officials have said a number of federal agencies are in need of new space and anticipate most or all of them will locate downtown in keeping with a presidential order that requires the GSA to exhaust opportunities in a city’s core before exploring suburban options. In October, the GSA agreed to lease 47,000 square feet in the Financial Center on the opposite side of Fifth Avenue North from the Regions Plaza. That space will house displaced workers from the Robert S. Vance Federal Building & U.S. Courthouse while it undergoes a $42.5 million renovation for the next three years or longer. U.S. Treasury Department seeking 75,000 square feet to relocate from Homewood. U.S. Department of Labor and the Bureau of Mines looking to share 20,000 square feet. An unidentified agency needing 27,000 square feet of space. 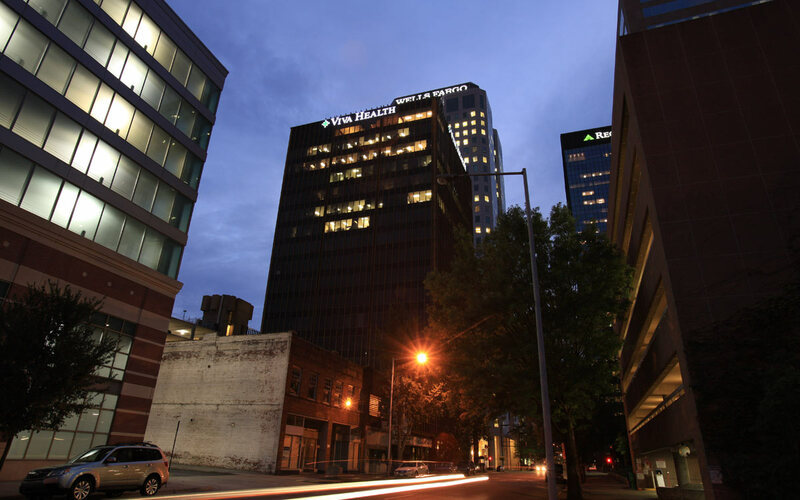 John Pavone, the West Second Street broker leasing the building, would not say if any of those entities are possible tenants when interviewed by The Birmingham News in October, when the newspaper first reported West Second Street had an option to buy the building. At that time, Pavone said the company was open to leasing the space to most any office user. The firm’s marketing flier says the building, built in 1974, can be leased in increments as small as 11,695 square feet and as large as the entire building, at annual rates between $15 and $30 per square foot. The flier said a tenant would also have the ability to brand the building with its own signs and said the property is on “Main and Main” in downtown Birmingham.